This cute musical duo called MGMT has a new video for “Electric Feel,” the second single off their debut album, that I am obsessed with a little bit. I’m always a sucker for thin, cute, scruffy boys. And these guys seem to perpetually have their shirts off. They’re a little airy-fairy for my taste. They’re, like, all mystic pagan and stuff. Which I’m sure is, like, really cool and stuff. But I’m willing to go along with them, up to a point. They dance in the woods with their cute human and animal friends. They pull the moon down and cut it open like a boiled egg and spread moon juice on each other. Then they put the moon back in the sky. What could be more adorable — and responsible — right? The creepiest part of the video is about a minute and a half into the clip, when we get a glimpse of something that brings me back to an uncomfortable childhood memory. We see a hillbilly bear strumming a rough-hewn banjo, a space dog on drums, a disco gorilla on keyboards, and who knows what else, acting as their band. 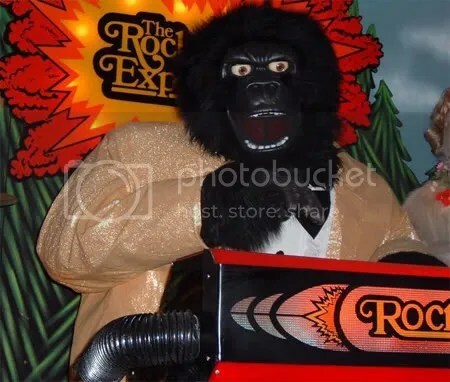 They are the animatronic characters from Showbiz Pizza Place (called the Rock-afire Explosion, I have recently learned), and they terrified me as a little kid. Yikes! Who can keep down their dinner with this staring out at them? Showbiz Pizza and Chuck E. Cheese’s and establishments of that ilk were fun for two reasons: mass quantities of pizza, and video games. But they’d also stage these little rock shows where the robotic house band would perform some reworked pop songs and tell jokes and banter with each other. I sort of looked forward to it, they way you look forward to the money shot in a slasher movie. But, like those movies, when the money shot came, I found I could not look any more. Whenever a character spoke, a spotlight would shine on it, revealing an eerily glowing plastic and fur behemoth with a curve to the mouth and a roundness of the eye that was meant to suggest friendliness but always came off as much more sinister. Their eyes and mouths snapped open and shut. Their movements appeared jerky and repetitive. Stand close enough and you could hear the mechanical skeletons clicking and clacking. The mouse cheerleader was the worst! And when the whole mess of them was moving at the same time, it felt like at any moment they might leap off the stage and carry me off to their evil robot lair where they would tear me to pieces and use me for spare parts. They’re all over YouTube now in videos where they have been programmed with songs hilariously inappropriate for their pre-pubescent audience. It is brilliant, and it underscores their unavoidable creepiness.